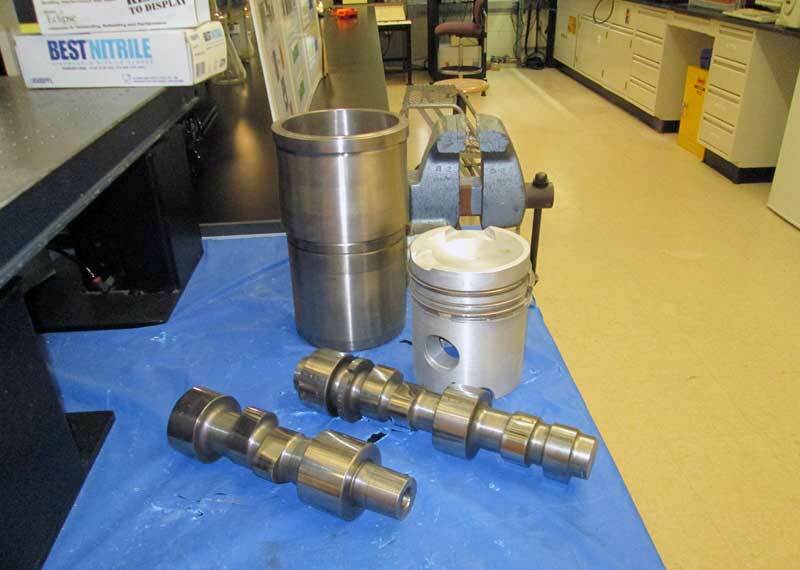 Research includes experimenting with engine parts, including the piston, liners and camshaft. 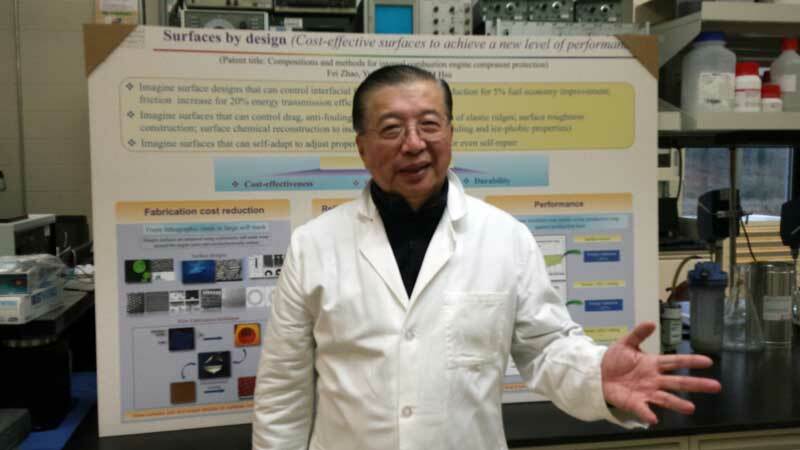 Prof. Hsu pictured with his research poster "Surfaces by Design: Cost-effective Surfaces to Achieve a New Level of Performance." 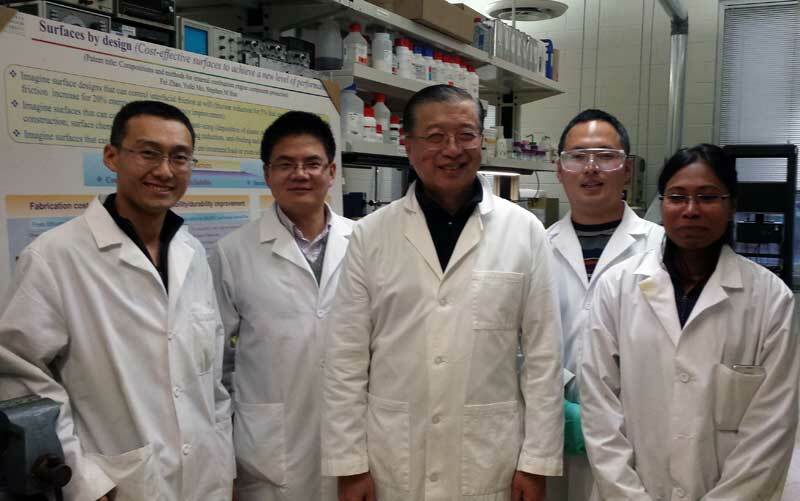 Prof. Hsu, center, pictured with his GW research team. 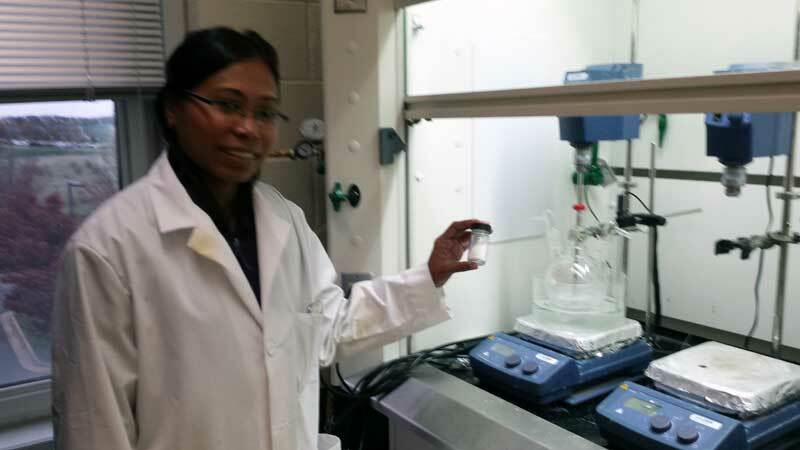 GW researcher pictured in the Energy Efficiency Research Lab with a vial of encapsulated nanoparticles, in front of the magnetic stirrer with hotplate. 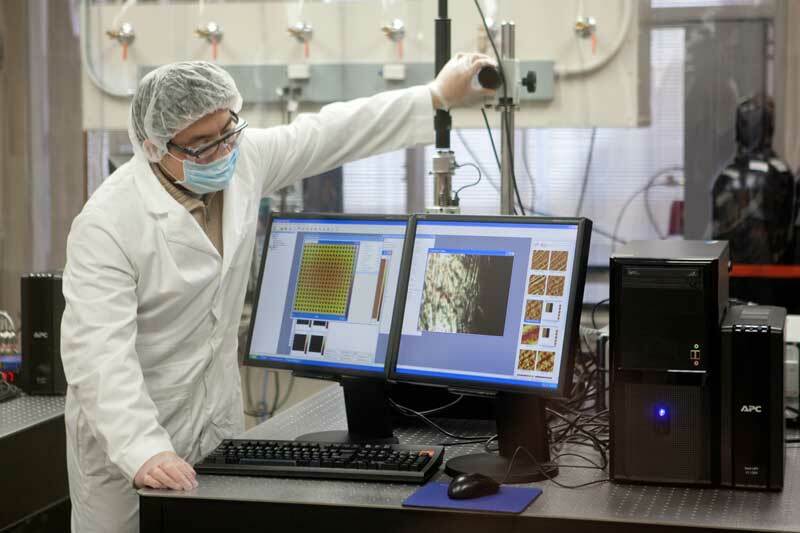 GW researcher in Prof. Hsu's Nanomaterials & Nanomechanics Laboratory. Stephen Hsu, a professor in the GW School of Engineering’s Department of Mechanical and Aerospace Engineering, is developing an innovative friction reduction technology with a recently awarded $1 million, three-year grant from the U.S. Department of Energy to increase the fuel economy of vehicles by at least two percent. His new technology will potentially save the United States 140 million barrels of oil per year and help the automobile industry meet new fuel economy regulations. 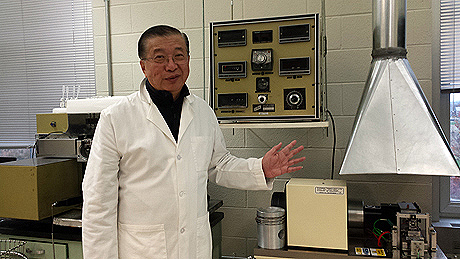 Prof. Hsu is leading a project team consisting of a car manufacturer, an oil company and several additive companies. The collaborating companies are providing matching funds to translate the concept into reality. The automotive industry is under pressure to develop more fuel-efficient vehicles since President Obama introduced new Corporate Average Fuel Economy (CAFE) standards in 2012. The new regulations require that automakers increase fuel economy to 54.5 miles per gallon for cars and light trucks by 2025. The current average is about 27 miles per gallon. Consumers also would save $1.7 trillion on gasoline, said Prof. Hsu. But how will car companies double their vehicles’ fuel economy within the next decade? “It’s very difficult to design new technology and then implement those changes that quickly,” Prof. Hsu said. To help car manufacturers reach the president’s goal, the U.S. Department of Energy challenged researchers and corporations to develop advanced vehicle technologies. The federal agency chose Prof. Hsu’s proposal from dozens of competing teams. 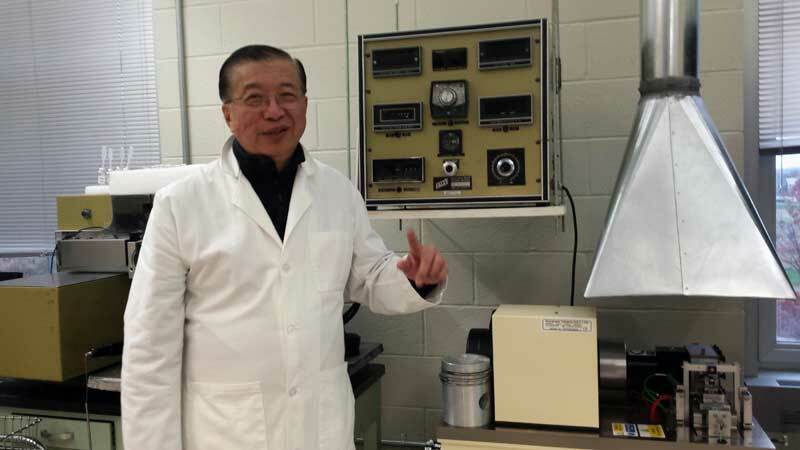 Prof. Hsu is developing the integrated friction reduction technology in his Energy Efficiency Research Laboratory and his Nanomaterials & Nanomechanics Laboratory at the GW Virginia Science & Technology Campus. As the principal investigator, he is also leading and coordinating the combined research efforts of the team. While the in-depth research is much more involved, it can be understood in layman’s terms as making the engine and related fluids work more efficiently in a vehicle by reducing friction. 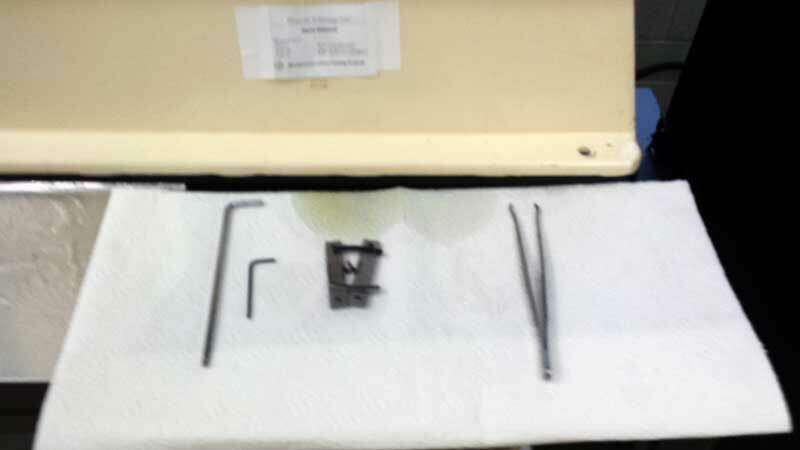 GW’s materials technology research includes novel approaches to fortifying engine component surfaces via thin films and surface texturing. Researchers are using new friction reduction additives, low viscosity fluids and microencapsulated time release chemical agents, which all need to work together in a delicate balance to achieve the desired results. During the three-year project that runs from Oct. 1, 2014 to Sept. 30, 2017, Prof. Hsu will work with the industry collaborators to test his concepts and fabricated prototype parts. The team’s work will include actual engine and vehicle testing to critically assess these concepts. Industries and research entities will need to rapidly develop innovative technologies such as these in order to meet the 2025 deadline for the targeted fuel economy regulations.